The heart functions without us having to think about it and beats around 70 times every minute during our lifetime. That means that we have just over 100 000 heart beats every day, over 36 million heart beats every year and, if we live to be 80 years old, 2.94 billion heart beats during our life. 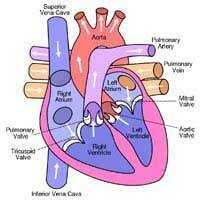 Each time the heart beats, it forces 0.07 litres of blood out of the left ventricle and into the body. This blood has just been to the lungs to pick up oxygen. The fresh blood is sent out through the main arteries, and then smaller arteries and capillaries, until it reaches every cell in the body, whether in the main organs, the top of the head, or the little toe. Using the calculations on how many heart beats we have, this means that the heart pumps 7000 litres of blood every day, 2.5 million litres of blood every year and 200 million litres in the lifetime of someone who lives to be 80. Even when you are sitting down, doing not very much, your heart is working hard. It is pumping blood around the body and to the lungs to get fresh oxygen and the blood leaving the heart through the main arteries is travelling at 450 millimetres a second. It slows down as it goes through the smaller vessels, to about 0.5 mm each second when it gets into the tissues and organs. This is important because the blood needs to unload the oxygen it is carrying in the tissues, so that the cells there can use it as fuel. If the blood was travelling faster than this, there would not be time for enough oxygen to be transferred. As you carry on sitting still, your heart pumps around 4 litres of blood every minute but if you get up and do something strenuous, like go for a run, or play football or squash, this increases to a massive 27 litres per minute – that’s an increase of nearly 700 per cent. There is a lot of data about the human heart because this is so important to know to keep our hearts healthy and to treat people who develop heart problems. But some of the facts that are known about the hearts and circulatory systems of other mammals make the human heart seem small in comparison. The heart of a horse at full gallop pumps 53 litres of blood around its body every minute. The main artery of a blue whale has a diameter of 30 centimetres, compared to about 5 centimetres in a human body. Some animals have hearts that can do things a human heart can never do. A hibernating hedgehog, for example, has a heart that beats about 250 times every minute when it's awake; this goes down to about 150 beats per minute as it sleeps but down to only 5 beats per minute when it hibernates in winter. A bat also does amazing things with its heart – this beats at around 25 times a minute when it hibernates but rises to 1000 beats per minute when it is flying at full speed. That’s an increase of 4000 per cent. The shrew, which really lives life in the fast lane, has a heart that beats 800 times every minute – when the animal is at rest. All of us have around 8 pints, or 4 litres of blood in our bodies at any one time – blood makes up 7.5% of our body weight. A woman who weighs 60 kilograms therefore has 4.5 kilograms of blood rushing through her blood vessels. Each red blood cell lives for 120 days before it is replaced. It is probably worn out by then, as it has been travelling around in the human blood system, which is over 96 000 kilometres long in total, which is over twice the circumference of the Earth. I was interested in reading about Heart Health, However, I feel there was not enough recommendations for suitable exercises for the elderly. I have always known that obese people are living dangerously, but I am 14stone 4lbs and 5ft 1in. My age is almost 71. But, I am not a secret eater, I live on my own so don't cook, and I have had hypothyroidism since I was 56. Why isn't there any real advice for all the hypothyroid sufferers in the UK. We don't want to be accused of OBESITY! We are not secret eaters, we are not lazy, we are just fed up of doctors giving us Levothyroxine and telling us there is nothing else they can do. Found this information very useful as I am currently preparing a presentation on heart disease and diet. Very interesting facts and a broader picture of things, thank you.